Men in search of quick fortunes began drifting into Death Valley after the Civil War, hoping to find a lucky strike of gold or silver. In 1881, one such prospector, Aaron Winters, was living with his wife, Rosie, at Ash Meadows, a desolate place near the Funeral Mountain, on the east side of Death Valley. Spiller indicated that a fortune could be made by anyone lucky enough to find borax beds in Death Valley. Winters questioned the visitor. He learned that when sulphuric acid and alcohol are poured over borax and ignited, the mixture burns with a green flame. After Spiller left, Winters obtained the chemicals he needed to make the test. He was certain he had seen deposits in Death Valley resembling Spiller’s description of borax. Making camp at Furnace Creek in Death Valley, Winters and his wife went to a nearby marsh and gathered up some deposits. They then waited for nightfall to make the test. As darkness closed in, Winters placed some of the deposits in a saucer, poured sulphuric acid and alcohol over them and struck a match. It was an anxious moment. For years, the couple had lived like desert Indians, eating mesquite beans and lizards when they had no flour and bacon. Rosie had suffered keenly from the desperation of their situation. Now, in a moment, the color of a flame would tell them whether they could look forward to better things, or only more of the same dreary existence. Winters sent samples of the material to the William T. Coleman Company in San Francisco. He then quietly filed claims to the water rights at Furnace Creek. A canny fellow, Winters knew that a borax plant couldn’t operate without water. A Coleman representative soon arrived at Furnace Creek. Winters haggled until he had secured the promise of a check for $20,000 for discovery rights, to be paid immediately after he had shown the Coleman representative where the deposit was located. The representative may not have been entirely happy when he found out that the borax was located in the middle of nowhere; nevertheless, he handed over a check and began staking claims. Then he discovered that Winters owned the water rights. The Coleman representative had no choice but to reluctantly hand over another check, for $2,500, to secure those rights as well. With his newfound wealth, Winters treated Rosie to a shopping spree in San Francisco, before settling down with her on a desert ranch outside Pahrump, Nevada, which he had purchased for $20,000. Rosie bought new dresses and other comforts, but she did not have long to enjoy her newfound luxuries. In 1887, Aaron Winters, owing back taxes, lost all but a small part of the ranch. However, he remained a part of the Death Valley borax story. Death Valley, with a brutal environment, has been the scene of many tales. Located only 80 miles east of 14,500-foot high Mount Whitney, Death Valley, at a place called “Badwater,” holds title to the lowest spot in the Western Hemisphere282 feet below sea level. Death Valley experiences ground temperatures as high as 190 degrees Fahrenheit. Indians called the place Tomesha  “ground afire.” It consistently ranks among the hottest places on earth. In 1849, William Lewis Manly was accompanying a group of prospectors who wandered into the valley on their way to the Sierra Nevada gold fields. They began to suffer in the Death Valley heat. While others stayed behind, Manly continued on, eventually reached Los Angeles, and, after being gone for 26 days, returned with food and water. When what was left of the group finally left the torrid area, one survivor looked back a final time and exclaimed, according to Manly, “Goodbye, Death Valley.” The name has endured to this day. The value of borax has been known since ancient times. Explorer Marco Polo brought borax back with him from Mongolia, where it had been used for centuries in the manufacture of stain-resistant porcelain glazes. In modern times, the versatile mineral has been used in the preparation of medicated bandages, antiseptic solutions, cosmetics and enamel. It has traditionally been prized as a cleansing agent. It is used in the coatings of playing cards and most glazed papers. 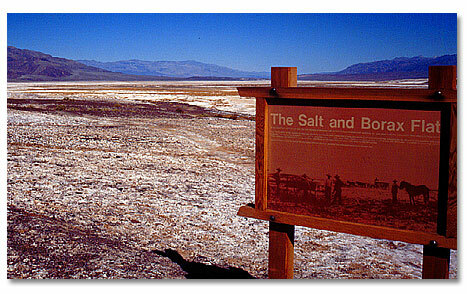 Although Death Valley was reputed to contain every mineral that made California famous (gold, silver, copper and lead), it was the unromantic borax that propelled the valley into prominence. Borax’s history in Death Valley goes back seven million years, to a time when volcanic activity and flash flooding hammered the land surface. Heavy rains washed large volumes of mud and silt into lakes, forming thick siltstone beds. Volcanic eruptions blew ash into the lakes; these, too, formed layers on the lake bottom. The ash deposits contained boron, a principal element in borate crystals. Ash deposits continued to build up. Over time, evaporation concentrated what had been lakes into a salty solution from which Death Valley's borate deposits crystallized. Aaron Winters wasn’t the first person to find borax in Death Valley. A Frenchman named Isadore Daunet beat him to it by six years. Born in the Pyrenees in 1850, Daunet came to San Francisco with his family at age 10. Soon thereafter, he ran away and roamed the West for years, with little to show for it until the summer of 1875, when he wandered into Death Valley. Daunet had left Panamint City, California, with five friends to search for a mine in Arizona, taking a shortcut through Death Valley’s southern tip. That was a mistake. They soon exhausted their water supply. Daunet and another man set out to try and find help. In time, they met some Indians, who agreed to go back and rescue the men who had stayed behind. Two of Daunet’s party had already died when the Indians arrived at camp. Daunet and his companion pressed on to the town of Darwin, some 30 miles from Panamint City. There, Daunet found no one interested in some strange white crystals he had picked up in Death Valley. Years later, hearing of Winters’ sale of a borax deposit to the William T. Coleman Company, Daunet remembered that he had picked up something similar near the place where two of his friends had died. Daunet persuaded Gilbert Clemmons, a San Francisco broker, and Myron Harmon, a Darwin storekeeper, to join him in investigating the deposit. Satisfied that the Death Valley deposit was indeed borax, the men established title to a half section of mineralized land, 22 miles south of Aaron Winters’ find. They founded the Eagle Borax Company, an enterprise entirely independent of the Coleman operation. They hauled a boiling pan and crystallizing tanks in over the mountains. They hired 50 men to gather borax from the desert floor. They began production in the autumn of 1882. Unfortunately, the men knew little about refining borax. Their first shipment was impure and brought only eight cents a poundabout the cost of production. Moreover, as hotter weather arrived, Daunet discovered that the tanks would not cool enough for borax to crystallize efficiently. That forced him to close down for the summer. The purity of the end product improved somewhat during the second season, and Eagle began making a little money. Daunet celebrated by marrying a French Canadian divorcée  Clotilde Garraul  in San Francisco. She made it clear from the start that she would not rough it by living in Death Valley. After the wedding, Daunet returned to his borax operation. He spent a second summer with Clotilde, but when he next returned to San Francisco, a process server greeted him. Learning that his financial situation was bleak, Clotilde had filed for divorce. Convinced there was nothing to live for, Daunet killed himself. The Eagle operation eventually passed to Coleman. William T. Coleman was born in Cynthiana, Kentucky, in 1824. He had joined an emigrant wagon train headed for the gold fields of California in 1849. After reaching Sacramento, Coleman decided that he could make more money catering to the needs of prospectors than by wielding a pick and shovel himself. Coleman was consistently successful in business from his very first transaction. He found a merchant who promised to buy as many bottles of a certain patent medicine as he could deliver at $5 a bottle, and another merchant who would sell him 300 bottles at $3 each. Within a year, Coleman had established a general merchandise business, William T. Coleman & Company. 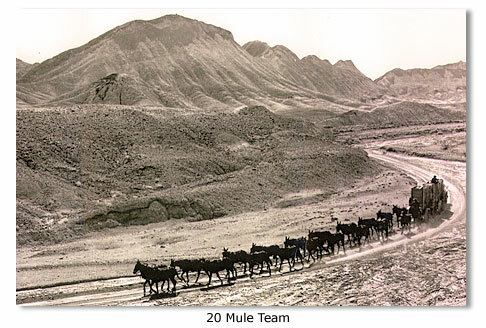 In its first years of operation, Coleman’s company created a landmark in the history of transportthe mule-team trek, which later inspired the “20 Mule Team” trademark. 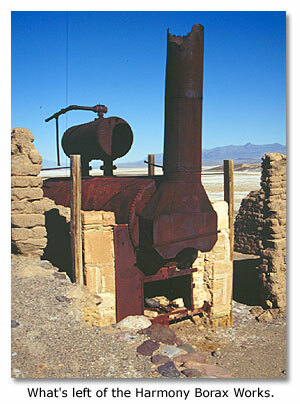 In early 1883, Coleman built a borax mill on the edge of the marsh where Aaron Winters had found borax crystals. Coleman then organized the Harmony Borax Company. The Harmony Borax Works began production and shipping in the winter of 1883 and 1884. Before summer arrived, Death Valley was already alive with business. At just that point, Aaron Winters reentered the picture. On his ranch at Pahrump, two men named Parks and Ellis had approached Winters. They showed him some soapy white material that they claimed to have picked up at a place overlooking the dry bed of the Amargosa River. Could this be borax? Winters told Parks and Ellis to return after dark. When darkness came, he made the test. It “burned green,” just like before. Winters made the men a proposition. First, he would have to see the exact location and make certain that the deposit was as big as Parks and Ellis claimed it was. Then, if the pair agreed to divide the proceeds by three, with one-third going to Winters, he would undertake to sell the deposit. Parks and Ellis agreed. After surveying the area, Winters brought borax samples to Coleman’s representative. A short time later he had in his possession three checks for $5,000 each, one made out to himself and one each to Parks and Ellis. Coleman’s company now had another borax deposit. The Amargosa Borax Works offered precisely what Coleman needed to keep part of his operation working during the intense summer heat. When the Harmony temperature shot up as high as 130 degrees, the temperature at Amargosa would be a comparatively cool 110 degrees. 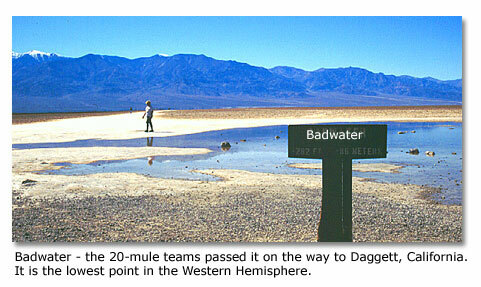 The 20-mile team would be born at the Amargosa Borax Works. Ed Stiles, a teamster, had been driving a 12-mule team for a man named Jim McLaughlin. Stiles learned that McLaughlin had contracted to do some driving for Eagle Borax. Before long, Stiles was driving a 12-mule team from the Eagle Borax Works to Daggett, California, hauling borax to a railhead, and then carrying feed and supplies back to Death Valley. Stiles sometimes varied the monotony of these trips by detouring through a mountain valley. On one such detour, he met up with a Coleman representative. Stiles soon went to work for Coleman, hauling borax from the Amargosa operation. McLaughlin eventually sold his mules and wagons to the Amargosa operation. Stiles went with them. One day, another driver, with eight mules and two wagons, came to Amargosa, where Stiles was getting his outfit ready. Al Maynard, the foreman, and J. W. S. Perry were in the office. Maynard asked Stiles: “Ed, do you think you could hook up eight more mules with your string, put on an extra trailer, and handle the whole outfit?” Stiles replied: “Why not?” Maynard then said, “It’ll take a long string.” Stiles agreed. “All right,” Maynard said, “if you can do it, go ahead.” Stiles laid out chains for 20 mules ahead of his lead wagon. He then demonstrated that he and an assistant could manage the huge team. Following that, Perry gathered together all the information he could find on big wagons. On the basis of his study, he had 10 built to his specifications. The beds, built of oak planking reinforced with oak strips, measured 16 feet long, four feet wide and six feet deep. The rear wheels measured seven feet in diameter, the front wheels, five feet. Teamsters were men of few words, without families. They were especially resourceful. They regarded the care of a sick animal or shoeing of a mule simply as part of the job. They had to endure long periods of heat and exposure. They also had to know how to drive huge teams around twists and turns of the road, up and down hills and over dangerous grades. A distinguishing tool of a teamster’s trade was his enormous whip, believed to be the longest ever used. It consisted of a 22-foot-long and one-half-inch wide rawhide lash with a two-foot-long “cracker” on the outer end. Correct use of the whip involved a two-handed operation, utilizing the sway of the driver’s body from the waist up. Some drivers developed such expertise that they could flick the ear of any mule within 25 feet of the seat. Mainly, however, they used the whip as a noisemaker, relying on its “crack” to stir a team to action. The favored route for borax wagon trains traveling between the Harmony Borax Works and the railhead was through Wingate Pass  a natural route into and out of Death Valley  and on across the desert to Mojave, California. Prospectors used the route, too, but it is best remembered today as the borax team route. Chinese laborers working for a company called the Harmony Borax Works broke down pinnacles of rock salt with sledgehammers to make a road for the mule teams to cross the rugged region called the Devil’s Golf Course. 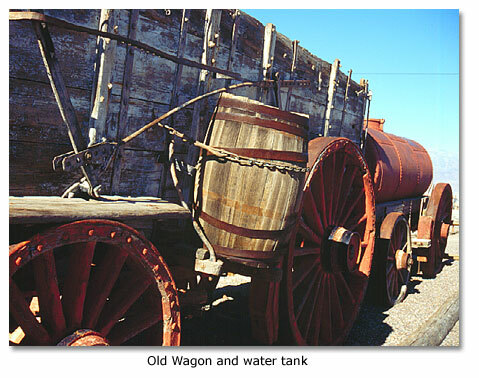 The wagons would proceed down the east side of Death Valley, past the oasis of Greenland Ranch, which was to become famous later on as Furnace Creek Ranch, then on across the valley floor along a primitive road. The heyday of the Harmony operation was from 1883 to 1888. During those years, the teams ran like clockwork, completing the 330-mile round trip between the Harmony Borax Works and the railhead in about 20 days, despite the difficult terrain. One team loaded and left the works every four days. It was a rugged life, hard on the animals and the men. True, they had a water wagon hitched on behind, but by the time they reached Mojave, drivers were ready to do justice to some whiskey and a game or two of faro. Much has since been written to romanticize the borax teams, but the men who had to deal with the harsh realities of Death Valley no doubt couldn’t see the romance through all the perspiration. By 1888, Harmony’s mule teams had hauled over 20 million tons of borax. Harmony Borax had been financially kind to William T. Coleman and might well have remained so. But in late 1888, borax prices tumbled when deposits of the mineral were discovered closer to rail lines. Financially devastated, Coleman filed for bankruptcy, and the torch of borax leadership passed to Francis Marion “Borax” Smith, a borax producer with extensive borate properties in western Nevada. Smith bought Coleman’s holdings and incorporated them with his own as the Pacific Coast Borax Company. 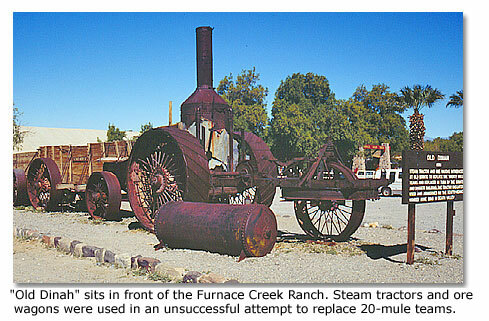 The death knell of the mule teams was sounded in 1890, when a narrow-gauge railway was built from Death Valley to Ryan. Smith’s operation flourished in the 1890s. He hired J. W. Mather to administer his New York office. In Mather’s first year, borax sales quadrupled. Mather’s son, Steven, more than earned his keep with Pacific Coast Borax by thinking up innovative ways to boost sales. Young Mather, who had been a reporter for the New York Sun, knew a good human-interest yarn when he saw one, and Death Valley borax was such a story. The mule teams particularly tickled his journalistic  and commercial  fancy. Mather persuaded a fellow Sun reporter, J. R. Spears, to write a book to help glamorize borax. Spears produced Illustrated Sketches of Death Valley, which put the 20-mule team on the map. 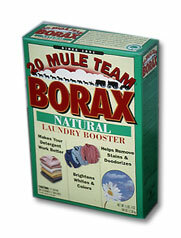 “Borax” Smith’s initial enthusiasm for a proposal by Steven Mather to use the “20 Mule Team” as a corporate symbol was cool. “No, I can't say I like the idea of the ‘Mule Team’ brand of borax,” he said. “My name and that of the company should be in the foreground.” Eventually, Mather prevailed, and the name “Smith” was eclipsed by an illustration of a 20-mule team as the company’s trademark. Once committed, Smith jumped in with both feet. He refurbished two Death Valley wagons, trained a new mule team and sent it to the 1904 St. Louis Exposition. He published a booklet titled The 20 Mule Team And A Sketch Of Its Famous Driver Borax Bill. “Borax Bill” was, in fact, William Parkinson, a bulky man who knew little about mules. Nevertheless, he was a quick study and played the role of Borax Bill with flair. In St. Louis, Parkinson put the big team through its paces using a whip and a string of curses that made crowds gasp. The appearance was so successful that Smith sent the team on an East Coast tour. Over the next few years, “Borax Bill” and his 20-mule team lumbered through the streets of many American cities. However, instant fame and social mobility was heady stufftoo heady for William Parkinson. As “Borax Bill,” he began to insist on so many perks that he eventually had to be recalled. After a 10-year hiatus, the company managed to get further mileage out of the 20-mule team imagery. It signed on a new “Borax Bill”  Frank Wilson  to drive a big team from the Pasadena Rose Bowl Parade through the Eastern states, romanticizing Death Valley and promoting sales of “20-Mule Team Borax” as a laundry product. In the mid-1930s, an advertising agency tapped into the endless popularity of all things Western by developing the Death Valley Days radio program for sponsorship by the company, now known as Borax Consolidated. As a result of “going on the air,” the consumer product end of the corporation helped boost the financial fortunes of Borax Consolidated. The radio program also paved the way for a long-running television show of the same name. Some 600 episodes of the Borax-sponsored TV show ran from 1952 to 1975. Stanley Andrews hosted the Western anthology series until 1965. Future U. S. President Ronald Reagan took over for a couple of years. He was followed in the host role by Robert Taylor and then by Dale Robertson. The show was shot at many historic Western locales, including, of course, in Death Valley, California.